Here are some fun ways to combine chords in common piano chord progressions to create well known accompaniment styles. You could also use the progressions as foundations for your own piano improvisations! If you play a selection of chords in a certain order, it is called a chord progression. With different types of progressions you can play certain styles, as the blues, or “imitate” a typical style like the “50’s progression” below, for example. Here are the chords in a C major scale with roman numerals. The numerals represent each step in the scale, I to VII. Capitals represent major chords and small letters represent minor chords. Here are some really fun chord progressions to try out! Play the chords in your right hand, the root of the chord in the left (bass) and hum or sing along! The three chord progression is the most common of all. With just three chords ( I, IV and V) you can accompany almost any tune! I – IV - V: Try them with P. Spector/J. Barry/Greenwich’s “Da Doo Ron Ron” for example. I - IV - V - V: Try it with Ritchie Valens' "La Bamba". The Isley Brothers'"Twist and Shout", and The Beatles's "Lucy in the Sky with Diamonds". I - I - IV - V: Millie Small's "My Boy Lollipop", Paul Simon's "Diamonds on the Soles of Her Shoes". I - IV - I - V: Solomon Linda's “The Lion Sleeps Tonight". I - IV - V - IV: Chip Taylor/The Troggs' "Wild Thing". It is used in: Paul Anka’s “Diana”, Rogers and Hart's "Blue Moon", Hoagy Carmichael's "Heart and Soul". 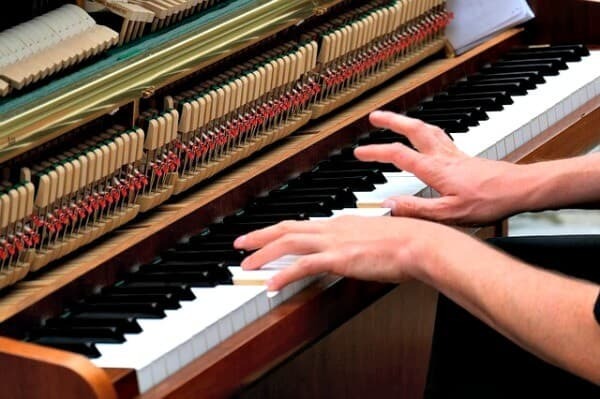 Piano chord progressions like Pachelbel's famous canon, is actually a bass melody that is repeated over and over. Like the blues pattern you could improvise on this ostinato (a musical pattern that is repeated over and over). This pattern moves a bit around the Circle of Fifths in a “zigzag” pattern; a fourth up, a fifth down etc. We’ll work with a simple C major scale to make two lovely piano chord progressions. For the regular chords without slash, your left hand simply plays the single notes of each chord base; C, F, A etc. The “slash chords” you see here, lets say Em/B means that you play the chord, Em in your right hand but the left plays B ! J. S Bach’s famous "Air on a G String" also has a very similar piano chord progression, as well as Percy Sledge's "When A Man Loves A Woman" and Bob Marley's "No Woman, No Cry". Play with Ray Charles' "Hit the Road, Jack". i - III -IV (or iv) - VI. 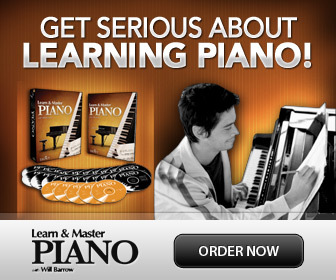 I hope you had fun learning these piano chord progressions!